Dave has been a trial lawyer for over 33 years. He has practiced in both state and Federal Courts. He has been and continues to be Judge Pro Tempore of the Riverside County Superior Court and is a well-known mediator for the local judges and bar. Dave has successfully mediated over 300 cases and has a uniquely high success rate. He has a certificate in Mediation from the Strauss Institute for Dispute Resolution at Pepperdine University. He is currently Vice Chair and Treasurer for the Palm Springs International Film Festival and was a past board member for Cielo Vista Charter School. He served as Chairman for the Economic Development Commission for the City of Palm Springs; was a board member for abused and neglected children for CASA (Court Appointed Special Advocates); was on the board for Equality California; was a board member for JFK FOUNDATION; a member and teacher for the Desert Mental Health Associations “HOTLINE” program to aid and assist those contemplating suicide; and was a long time columnist for The Desert Sun newspaper where his “The Way I See It” column appeared monthly for over 12 years. Dave has an extensive civil litigation and governmental affairs practice along with his specialty in banking law, loan modification, loan disputes and workouts. 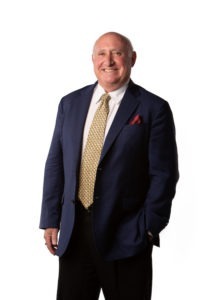 An experienced trial lawyer, Mr. Baron received the largest employment related verdict ever issued in the State of California; and during 1988, the 62.5 MILLION dollar verdict ranked as one of the top ten in the United States. Mr. Baron has extensive business litigation experience including a wide array of issues including all aspects of real estate and construction law, has represented newspapers, and has represented Indian Tribes, Tribal members and those conducting business with various Indian Tribes. He has handled partnership disputes, discrimination claims, as well as a myriad of labor cases. Dave was born in Chicago, Illinois, June 15, 1955. He was admitted to the bar in 1982 in California and U.S. District Court (Northern District of California, Southern District of California, and Central District of California). Dave received his B.A. at the University of California at Berkeley in 1977. He attended Hastings College of Law, University of California (J.D., 1982). He served as a Judge Pro Tempore for the Riverside County Municipal Court from 1986-1991. He was the chairman of the Palm Springs Economic Development Commission from 1988-1991. He has been a member of the Riverside County Superior Court Arbitration Panel since 1988. Other memberships include: Desert Bar Association (Member, Board of Directors, 1997-1999); Fee Arbitration Panel, 1989-2000; Founders Board, American Inns of Court, Warren E. Slaughter Chapter; American Bar Association; State Bar of California; The Association of Trial Lawyers of American. His areas of concentration are: Employment Law; Business Law; Construction Defect Litigation; Homeowner Association Law; Business Torts; Commercial Litigation; Real Estate and Public Law Litigation; Land Use; Zoning and Governmental Affairs.